On Friday (21 July 2017) the Holbeck Viaduct Project Team launched their pre-feasibility report at an event, attended by a enthusiastic group of local residents, businesses and decision makers. 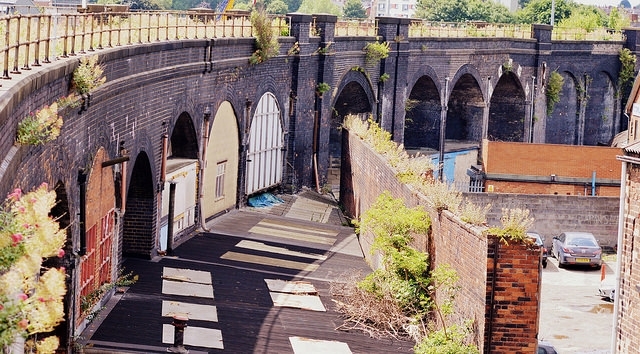 The Holbeck Viaduct Project seeks to reopen the mile-long viaduct, as a green public space for travel, events, growing, and much more. The viaduct was built in the second half of the 19th Century and has been unused since 1988. It starts in the City Centre near Granary Wharf and the train station, goes through Holbeck and eventually ends at open space near the Farnley ring road. The Holbeck Viaduct project is inspired by the acclaimed New York Highline, and other projects like it around the world. This volunteer-led scheme has elicited a considerable amount of enthusiasm and goodwill. It’s not to be confused with the ‘Monkbridge‘ viaduct just north of Whitehall Road, which features a recently approved developer led scheme. Over the past year, a group of volunteers involving local Leeds residents from all walks of life have worked on the report. The high level report concluded that the scheme could work and that is worth exploring further, not least in discussions with Leeds City Council and Network Rail who own the structure. Friday saw the project team release the report at a busy event staged at Old Chapel Studios in Holbeck. Presentations from the team talked about the work done to date and their plans going forward. The project team were keen to show that the project needed to be delivered in partnership. This approach was shown by additional talks from Richard Crabtree from the developers, CEG Southbank and a talk from Cllr Richard Lewis (Exec Member for Regeneration, Transport and Planning). Cllr Lewis expressed his praise for the project and a willingness from the Council to work with the project team going forward. “It’s really great to see the huge interest, the viaduct project generates and this is shown by the support we get and the people willing to volunteer their time to develop the project. We believe our report shows that this scheme is very much feasible but there is a lot of work to do. Apologies Paul, it’s fixed now.